Last Summer I decided I wanted show Cory one of my all time favorite cities: Berlin! We went away for a little week in July just to catch out breath in the peak of wedding season. 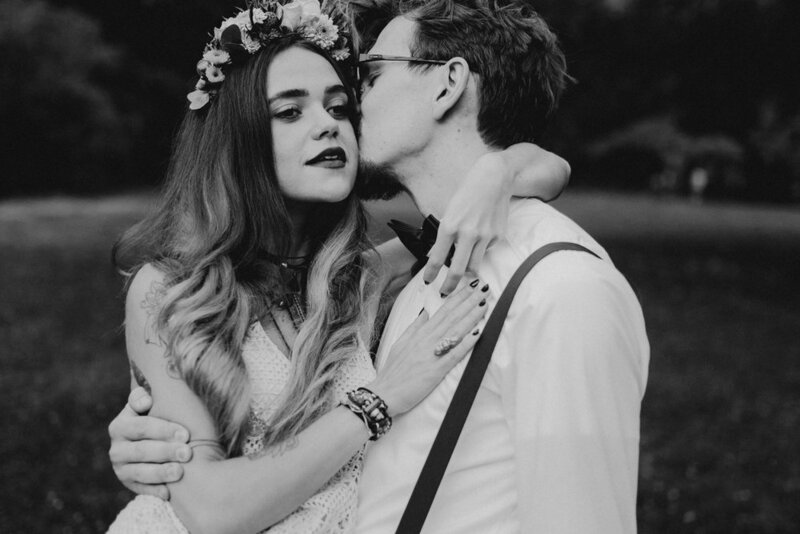 Before traveling there I had found the beautiful and inspiring Franziska on Instagram and asked her if she wanted to do a styled shoot with me whilst I was there. Lucky me she said yes! And even luckier was it that her boyfriend Florian was willing to be part of it as well. I loved photographing this lovely couple; so much love and sweetness between these two, both old spirits in their own way. I didn't plan anything else prior to traveling to Berlin except I knew the mood of the images would be based on a bohemian elopement in Berlin since that vibe reflected Franziskas amazing sense of style already. All of the jewelry in this shoot are her own - and they matched perfectly with the dress. When I arrived to Berlin I very last minute contacted a florist: Blumen-Sühr, who's work I was familiar with because I had seen a german styled shoot they had done the flowers for. Luckily they had time to help me out and made the most amazing over-sized wedding bouquet and matching flower crown for my bohemian bride. I hadn't brought anything with me to Berlin besides my camera, so I was roaming around shops for days trying to find a dress Franziska could wear. 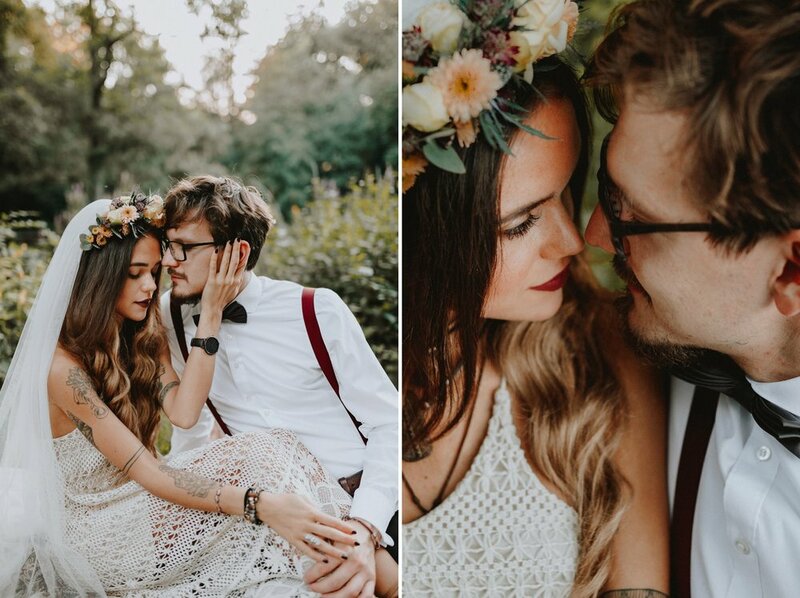 I ended up finding a lovely crochet dress in H&M and since the theme was a free spirited & bohemian wedding/elopement – it was perfect. Turned out that Franziska actually worked in bridal dress shop and she was able to borrow the veil from them which added to the whimsical feel of the shoot. I didn't know what Florian was going to wear, but on the day I was so pleased with what they had chosen: they completely understood the look I was going for – I loved those burgundy suspenders. On the day I went crazy and bought props: glasses, plates, a wooden cradle, the "bohemian" throw - bought organic fruits, vegan cake and from our Air BnB I borrowed the Moroccan table. I started off with wanting to do an ordinary semi-styled couples shoot and ended up doing a whole styled shoot in a city where I had none of my regular props, car or connections... Although my styling was somewhat mediocre I worked with what I had could gather; and like the result :) It started small and grew as we came to Berlin. You see, I don't really know how to things like this half way. Cory was so sweet about it and supportive, and I ended up loving the photos - so here is a little sneak peek of my bohemian elopement in Berlin. More to come.